The inevitability of having to move on from Tiger Woods after such a long relationship put EA Sports in a position where they felt it necessary to take the rebooted PGA Tour series in a totally different direction. 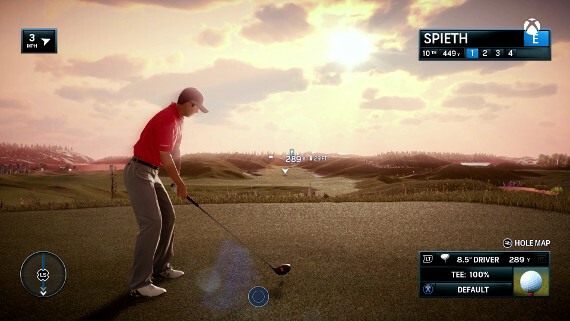 Rory McIlroy PGA Tour has aimed at appealing to a more “casual” consumer. Gone are healthy lineups of licensed courses and golfers, and nods to history of the sport. In their place are arcade-elements like fantasy courses and over-the-top mini-games. Over two years have passed since Tiger Woods PGA Tour 14, and the new McIlroy title comes up short compared to that game in most every area that matters. As a product, Tiger 14 offered significantly more content, all of which was far more compelling than what’s found in McIlroy, which feels barren and dull in comparison. It’s a struggle to find things that McIlroy does better. To its credit, the courses included in McIlroy look spectacular, and the presentation of them is fantastic. There’s some graphical blur and pop-in but otherwise the game looks nice despite appearing to be sub-1080p. The commentary is an improvement, though inaccurate at times, and the crowd sounds are decent though not always responsive at the right moments. The crowd looks good, is active, and you even see them applauding and walking around. The Prologue, which is essentially a guided tour through big moments of the US Open by McIlroy, ends up being the most interesting aspect of the game and that’s over after 20 minutes. Features one would hope for and expect, like tiebreaker playoffs and replay functionality, are absent. Instead some questionable design decisions have been made. Career Mode is very basic. There isn’t even a calendar you can view of upcoming events. Maybe that’s to hide that the lack of courses will make the mode stale fairly quickly. Adding in the “Quick Rounds” feature, which is defaulted on and already has people confused and wondering why they can only play a few holes each round, only compounds that concern. There are merits in allowing people to play through rounds quicker and certainly many people will appreciate the ability to do so. However it really creates a detached feeling, only playing 4-5 holes per round, and the sense of potential accomplishment vanishes along with it. At least it’s only an option but EA should have given people the choice up-front, similar to what they’ve done with the “Gameplay Styles”, rather than making it the default way to play in Career. Then there’s the pathetic create-a-golfer system. In a game that puts so much weight on playing with a created golfer, inherently due to the make-up of the game and the thin roster of licensed golfers, it’s really unacceptable. It’s also worth noting there is no “GameFace” type feature, which bizarrely was prioritized for NBA Live instead. One thing that works in McIlroy is the offering of three different “Gameplay Styles”. Other sports games would be wise to offer various ways to play that may be more accommodating to different people. The three offer different approaches that span from the “arcade” to the more “sim” – though the sim Tour style is still fairly easy to pick up and play. It seems that no matter how badly the shot stroke is mangled, the shot will go straight, it’s just a question of distance. Putting and getting out of precarious positions presents the extent of the challenge. The lack of loading time between holes (which The Golf Club has too) was touted heavily in promotion. Undoubtedly it’s a benefit to the new game but loading times into the courses are lengthy, and menu navigation is unresponsive and frustratingly laggy. I’m not against mini-games. I actually think they have a place within all sports games, even the sim-centric ones. They can be used as a teaching tool where people improve skills through the process that can then be applied to the actual games. The Night Club Challenge though is more of its own thing. It’s not going to help people in a way that translates to the normal golfing. It feels like something you’d play on your phone. The Night Club Challenge has some appeal despite that and is mildly fun – some will probably find it to be more and that’s especially true of completionists and those who enjoy the challenge of topping previously held high scores. The mode is boring at first but after a few challenges it starts to become more interesting. That’s when boosts start getting introduced and even elements like portals make their way in. I’ve gone through 24 of the 62 on Wolf Creek so far and there are still Paracel Storm and Coyote Falls to unlock along the way. 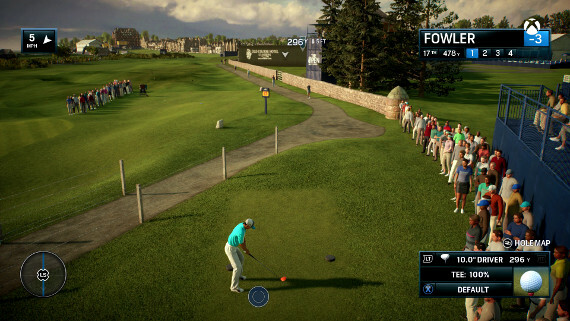 EA decided to introduce a new element into Online Play by rendering the other players onto the course along with you. In theory it sounds interesting but in practice it’s a dismal failure. Those players appear out of thin air and then vanish. They’re nothing more than a distraction. It was actually better in the past when you’d see their shot arcs instead. Online matches also have no commentary or crowd noise, making it a completely empty experience and a bore to play. Potentially it could be better with groups of friends who are chatting on mic together but that’s the only scenario where it would be passable. What EA Sports has delivered with Rory McIlroy PGA Tour is a game that doesn’t have enough content to justify its price at launch, and what it does have won’t resonate strongly with either the “sim” or “casual” crowd. EA has made mistakes with some other games in the past where they try and go this route of angling for ways to market a “sim” series to a “casual” audience. The results have been products that have no true identity, disappoint in sales, and are quickly forgotten. It would seem unlikely that McIlroy will avoid that same fate.